If successful, CSU and its partners will develop a supplemental cooling system that can efficiently remove up to 30% of the cooling load, helping to maintain the thermal efficiency of an air-cooled power plant. The team's dry-cooling system could help maintain power plant energy efficiency by providing a low-cost alternative to water cooling when water use is restricted. When combined with dry-cooling technologies, the team's system can eliminate the need for local water resources to generate power and help conserve water for other uses. 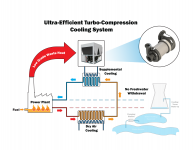 By integrating mass-produced heat exchangers and highly efficient turbomachinery, the system could be significantly cheaper than conventional dry-cooling systems.